Craftster Community > IMAGE REPRODUCTION TECHNIQUES > Other Image Reproduction Techniques: Completed Projects (Moderators: loves2experiment, LimeRiot) > Handcarved stamp (and my first post)! Handcarved stamp (and my first post)! Hi all! I've been hanging around this wonderful site for months now but finally got up the nerve to post. I started carving stamps a few months ago and have really enjoyed watching my skills improve with each one. Every new one I carve is my favorite and I think I couldn't possible love one more until I carve the next one and then I change my mind But this one is truly my favorite, it's a composite of 2 Kurt Halsey images that I put together to represent my cat and I. Without further ado, here it is! It's carved on Grade A PZKut (which = sweet sweet carving love) and a Staedtler #1 gauge carving tool. I hope you like it because I have tons more I can post! 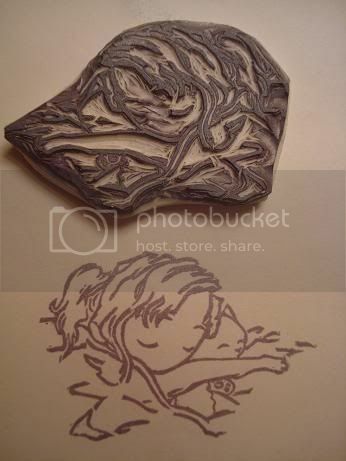 Re: Handcarved stamp (and my first post)! Squeee! So cute! You're good at that; stamp carving intimidates me. Thats adorible. Definate craftster love right here for you. And I second the motion to see your other stamps! I love love love it and would love to see more! I really want to try stamp carving but the materials seem to be a bit pricey here. This one makes me miss my kitty . My DH is looking over my shoulder. He said, "that's beautiful." 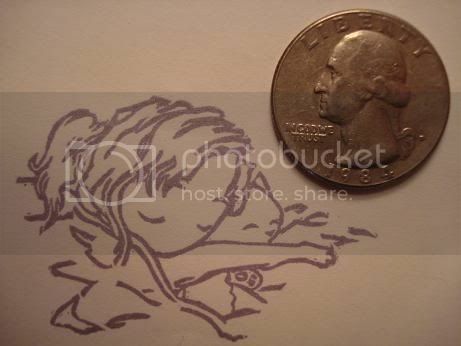 I was thinking how precious the image is, and amazed at how small. Thanks for sharing. I'm sure we'd all love to see your previous loves! Stamp carving is something I'd love to try one day.